Free Printable Outer Space Word Search. Free Printable Outer Space Word Search activity for your kids at home or students at school. Print this word search and try to find all the Outer Space related words. Share it with all your students, to have a great time searching all the words and learning about our universe. Find words like Planet, Astronaut, Earth, Coma, Solar System, Saturn, Light-Year, Hubble, Orbit, Asteroid, Satellite, Galaxy, Shuttle, Moon, New Horizons, Gravity, Comet, Telescope, Pluto and many more. The word search includes 28 Space related words and the answers on page 2. 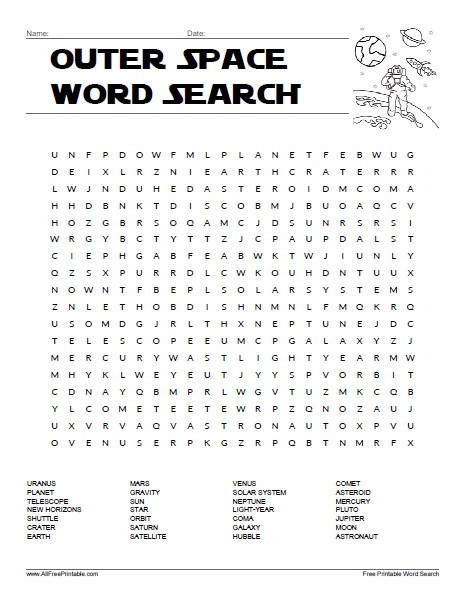 Outer Space Word Search Puzzle is ready to print in PDF format.